Cork City in Ireland has a healthy and prosperous small business sector. 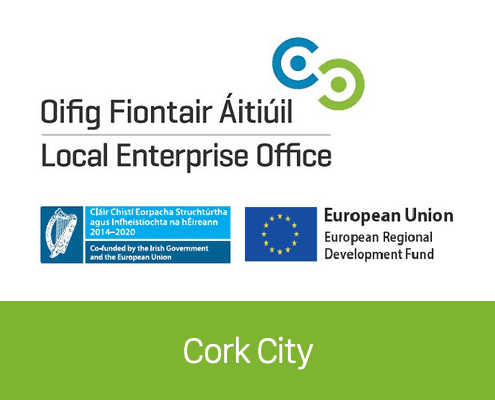 At the Local Enterprise Office, Cork City their goal is to ensure the continued growth and success of microenterprises in the region. Providing a range of business support packages to small-scale enterprises including business information & advice, mentoring and training. Providing direct financial assistance to qualifying businesses in the form of Priming Grants, Business Expansion Grants and Feasibility Study Grants. Before Submit.com Local Enterprise Office, Cork City was primarily using a manual paper-based system to manage grant schemes. This legacy system presented several challenges for the Local Enterprise Office. It had become dated, it was becoming increasingly costly and time-consuming to administrate. It was obvious that their time would be better spent with clients maximising their chances for success and making sure all applications are fully completed in a timely manner. On top of this, several teams worked within the different types of grants within the department – and they all had different processes to administrate grant applications. This was in stark contrast to the Local Enterprise Office desire to increase their grant spending but, do it more efficiently. They wanted to do more with less, and so they needed a better way of doing things. To help them solve this challenge, the Local Enterprise Office Cork City was not only looking for a new Grant Management System that allowed them to take advantage of the modern efficiencies they were missing out on, but a partner to help them standardise their processes, streamline their workflow and manage the transition to a new platform. They chose Submit.com to help them do this. To deliver the project, not only did Submit.com work in close partnership with the Local Enterprise Office Cork City Grants Management teams, but they also needed to collaborate with their IT team, and pay careful attention to the needs of the organisation’s fellows – which were of paramount importance. The Local Enterprise Office Cork City knew that their existing paper-based system, combined with non-standardised workflows, meant that they weren’t working as efficiently as they could be. We helped them to make improvements by challenging the way they currently operate, identifying the common ground between grant programmes and mapping out a new standardised process that made use of Submit.com Grant features to make their workflow less labour intensive. One of the biggest challenges that organisations like the Local Enterprise Office Cork City face are managing the change to a new system for all key stakeholders. The issue here wasn’t whether the software met their needs, but how to smoothly adapt the workforce’s existing workflows for the benefit of their client base. We knew from experience that it was best to take a direct approach here by building trust and enthusiasm in the change right from the initial discovery process. This meant stakeholders could see we were helping them to think differently about how they can work more effectively. We then implemented a ‘quick win’ for the staff by running an existing grant scheme on Submit.com in tandem with the existing paper-based process so they could see for themselves exactly how easy and efficient it was to use. We followed this up with tailor-made training programmes and the inclusion of personalised stakeholder onboarding as a crucial part of our delivery plan. A big challenge in the public sector – and by no means exclusive to the Local Enterprise Office Cork City – is staff moving between departments. Like in any organisation as staff moved on, this knowledge wasn’t always adequately transferred and often became lost. To help combat this, we introduced a universal formalised workflow. The implementation of a universal formalised workflow also ensured that the transfer of knowlegde was easily managed if staff moved to other jobs or organisations to make it easier to work on projects and bring new staff up to speed quickly. It is essential that the Local Enterprise Office Cork City can assure their clients that their information is managed in a confidential manner. By moving their grant application process online and using features such as Multi-Factor Authentication it gave the team additional layers of compliance & security for the confidential data collected. Because grant giving never stops, it means that we couldn’t just “switch off ” the Local Enterprise Office Cork City old system without considering the impact to existing live applications. This said we had to introduce a tapered approach to data migration – only moving it over once a grant had been awarded. Because the data was coming in such vast volumes from their old system, it had to be cleansed and reconstructed to work with Submit.com The upside of this was that Submit.com was then able to automatically handle a wide variety of administrative and reporting tasks that had to be done manually using the old system. As part of the Local Enterprise Office Cork City drive to do more with less, they wanted to understand their newfound efficiency when using Submit.com. To do this, we were able to leverage our system to help them produce metrics reports that measured things like how long it takes on average for an applicant to apply, or how long it takes to process an application. Working with Adrienne Rodgers and her team as the Local Enterprise Office Cork City to plan new processes, implement their new system, and migrate their data was a project that took almost two years. We didn’t just work with them as a 3rd party supplier. We built an ongoing, long-term, genuine partnership that enabled us to impart both our technical and grant management experience onto their organisation and add significant value. Submit.com is versatile, customisable, has incredible depth, functionality but at the same time easy to use all backed up by excellent customer support! There is no doubt it has brought significant efficiencies to our workflow. I would have no hesitation in recommending Submit.com.